All the pictures that are available for sale are in the PICTURES IN THE STUDIO section. To find out the price of the work that you are interested in, please make a request using the form, and I will respond to you as soon as possible. Almost all the pastels are framed under glass, with a mat. The mat is a colored piece of cardboard that creates a layer of air between the glass and the piece of work. In some cases the mat is quite wide, about 8 cm, while in others it is just 1 cm. 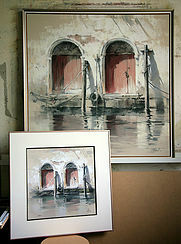 Acrylic paintings come without framing, and do not require any additional presentation. 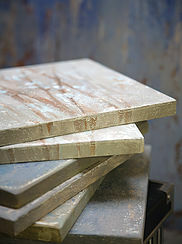 The height of the canvas is 1-2 cm, the edges of which are a continuation of the painting. Pictures are delivered all over the world. I use the services of ARTPOCHTA who specialize in the delivery of art and valuable objects in Russia and around world. They work with both DHL and UPS. The delivery price depends upon a number of things: the packaging, the delivery location and insurance. If the painting requires delivery outside of Russia, then the cost of receiving permission to send the painting abroad is added to the price. 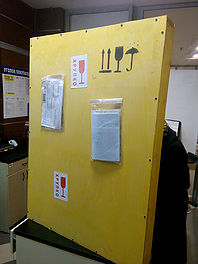 Before a picture is delivered, it is securely wrapped in either cardboard or placed within a crate with multiple layers of bubble-wrap to protect it. Each package is clearly marked, allowing delivery agents to provide the appropriate care required. The cost of the packaging and delivery is primarily related to the size of the picture and the materials used in its creation. Pictures framed under glass are always packed within a crate. You can find out the overall delivery price of your desired piece by sending in a question via the form at the top of the page. Please indicate the name of the picture and your delivery location. I will send you the full cost by email. After the price and the delivery terms have been agreed, please select how you would like to pay. If you decide to pay by bankcard, Yandex.Money or PayPal, use the payment form above. Unfortunately this service is unavailable on the mobile version of the site, so please use the full version of the site to make your payment this way. If you choose to pay by Sberbank.Online, Western Union or bank transfer, then further payment details will be sent to you by email. As soon as the payment has been sent, you will receive a confirmation with a tracking number. If you appreciate my work and would like to financially support my projects, then please feel free to click DONATE. Thank you!